Editors’ note: The Open Notebook asked Sally Mitchell, chemistry teacher at Rye High School in Rye, New York, to share the story behind her students’ project—an impressive rendering of the entire periodic table of the elements, in marshmallow form. The project, “Peepiodic Table of the Elements,” involved 74 students. 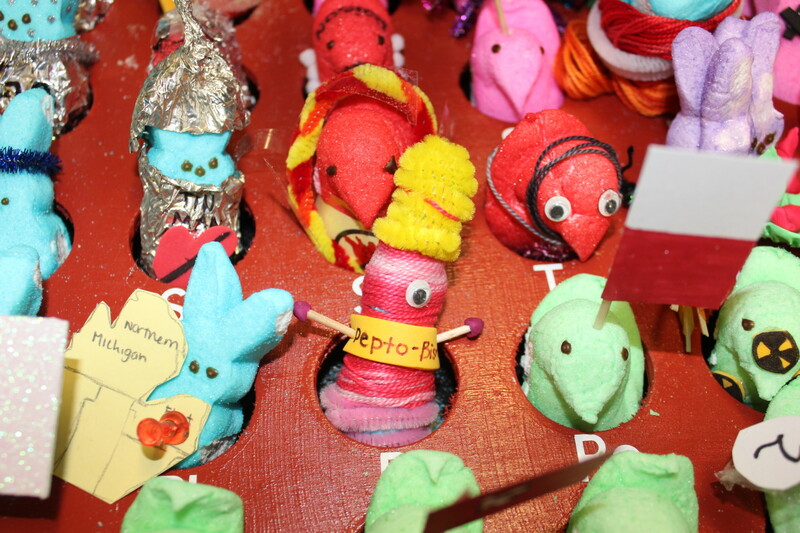 It won both the Silver Peep (Teens) Award and the Peeple’s Choice Award in The World’s Finest Science-Themed Peeps Diorama Contest in April 2019. This is the International Year of the Periodic Table (#IYPT2019) celebrating 150 years of the birth of the table presented by Dmitri Mendeleev in 1869. I am an active member of the American Chemical Society and the American Association of Chemistry Teachers. 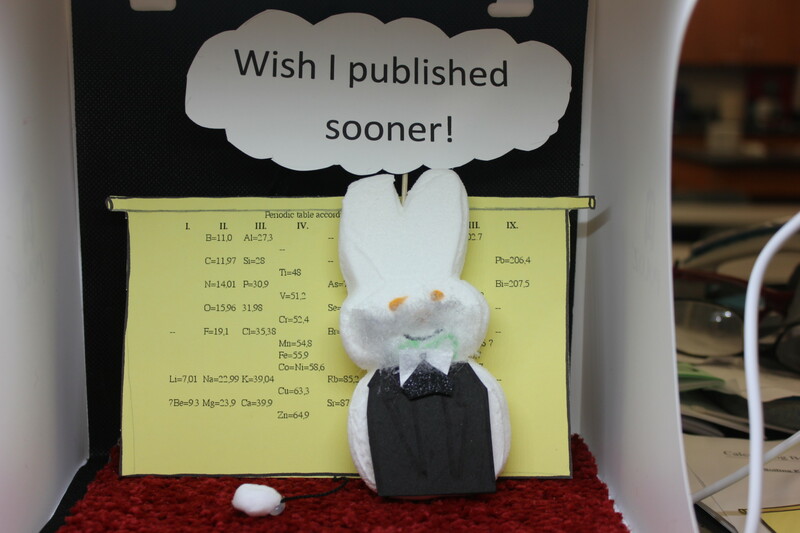 Chemists, teachers and students are working on many projects to showcase the importance of the periodic table. I decided to have my students create this peepiodic table of the elements after my mentor, Mary Virginia Orna from the College of New Rochelle, told me of The Open Notebook and this contest. With her suggestions and hard work of my students and ChemClub members, our table was born. 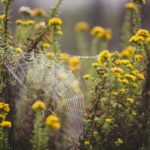 One of the cross-cutting concepts of the Next Generation Science Standards is patterns. The periodic table is all about patterns and trends in the way it was discovered and organized over time. 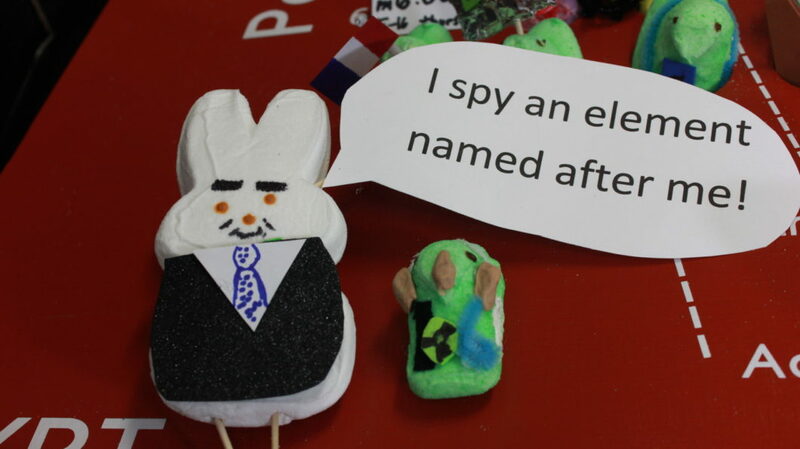 In our Peepiodic table of the elements, we color-coded Peeps to bring awareness to some of these patterns and to generate students asking questions about this phenomena. 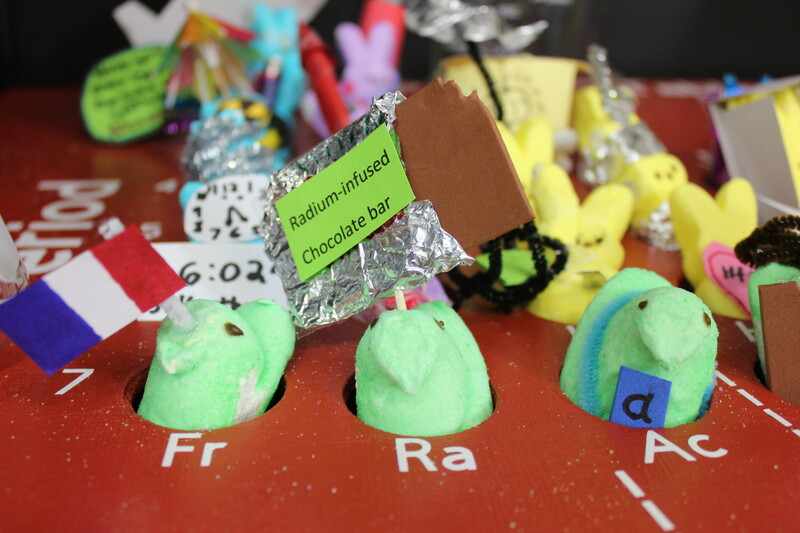 All of the elements that are green Peeps are elements that only have unstable isotopes. This means that these elements are always radioactive. You can see that elements 84-118 are green, along with technetium (element #43) and Promethium (element #61). All of the transitional metals are yellow Peeps. The seven diatomic elements (hydrogen, nitrogen, oxygen, fluorine, chlorine, bromine, and iodine) each have two identical Peeps together. 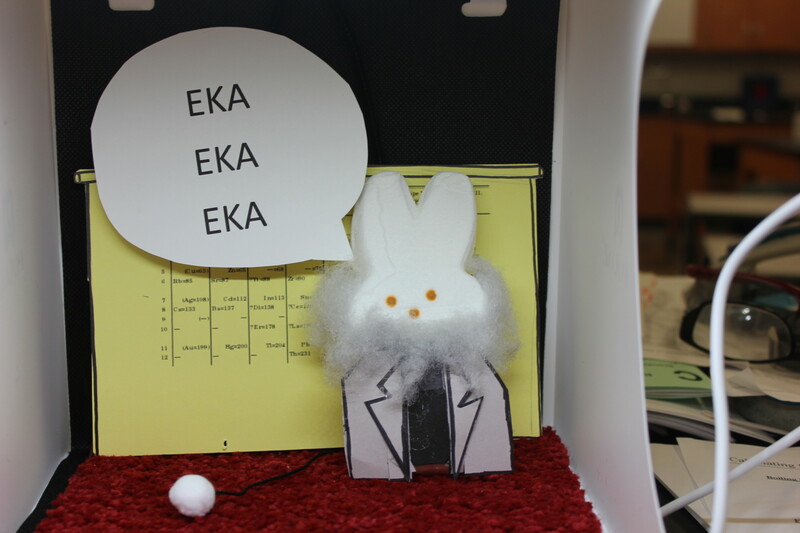 In our diorama, we wanted to showcase some of the history of the periodic table, highlighting the fact that Lothar Meyer had a periodic table almost identical to Dmitri Mendeleev, but seldom gets credit for his work. Dmitri Mendeleev, known as the father of the periodic table, was famous for predicting properties of un-discovered elements and he left holes in his table waiting for the discovery of them. Glenn T. Seaborg is the only scientist to have an element named after him while he was still alive. Glenn Seaborg was my hero when it came to chemical education. My students and ChemClub members had so much fun learning about their element and other elements as the table was completed. 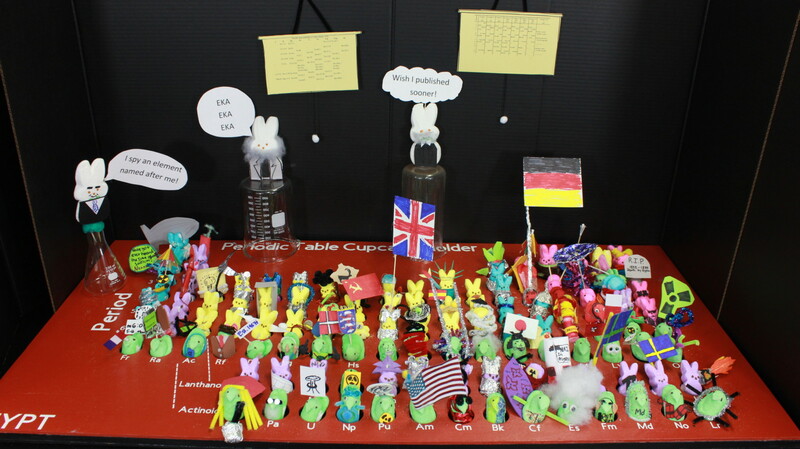 Using the peepiodic table allowed us to display patterns and trends in such an interesting way, my students will always remember their part in this icon of chemistry. While working on the “Peepiodic Table” I learned so much about how certain elements are used daily and many of us are unaware of such interesting facts. For example, the element I focused on was Bismuth, which I had no clue about, starting off with my research. To my surprise, I found out that Bismuth is in the medication Pepto-Bismol. Growing up, I never understood the name, so after some researching it turns out that “Pepto” comes from pepsin, a natural substance that aids digestion. And even though Pepto nowadays does not have pepsin anymore, the name stuck. Furthermore in my research, I looked for an answer as to exactly why the iconic pink coloring. Was it because the marketers liked it’s bright color on the shelves? Or was it because it was just something different? Well, Bepto Bismol is the color pink because of the compound Bismuth subsalicylate, which is the radioactive antacid medication known as Pepto-Bismol. Since I participated in the “Peepiodic Table” project, I became more fascinated by learning about the history of elements and how they are used. Thus, I am grateful for the opportunity to research and decorate my own Pepto-Bismol Peep while also learning more chemistry. Knowing Glenn T. Seaborg (at left) was my chemistry teacher’s hero, I thought to do a portrait so all would recognize Seaborg. Being element number 106, there are that many reasons and more to find Seaborgium (at right) a great element. Seaborgium is a (metal) solid at room temperature. It was created with the machine called the “Super-Heavy Ion Linear Accelerator” and all isotopes are radioactive. 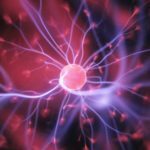 One isotope of it even has a half-life of just 1 second, though it’s most stable isotope has a half-life of 2.4 minutes. Glenn Seaborg, the man who element #106 is named for, co-discovered multiple elements including plutonium, curium, californium, einsteinium, and element 106 (Seaborgium). He won the Nobel Prize in chemistry in 1951 even before he reached the age of 40. (As an interesting note, Glenn Seaborg even holds a Guinness World Record for the longest entry of “Who’s Who in America.”) This beloved scientist has done so many wonderful things, more than anyone could list, and it was an honor to be able to make a featured Peep for him. As a note: IUPAC (the International Union of Pure and Applied Chemists) had a rule that elements could not be named after a living person. At the time of the naming of Seaborgium, Glenn T. Seaborg was still alive. After much controversy, IUPAC agreed to allow the naming of the element Seaborgium. 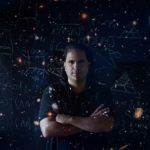 Seaborg died a year and a half later. 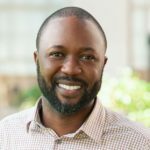 I wanted to do lead because of the crisis that is still plaguing people in Flint, Michigan with high levels of lead in the drinking water. 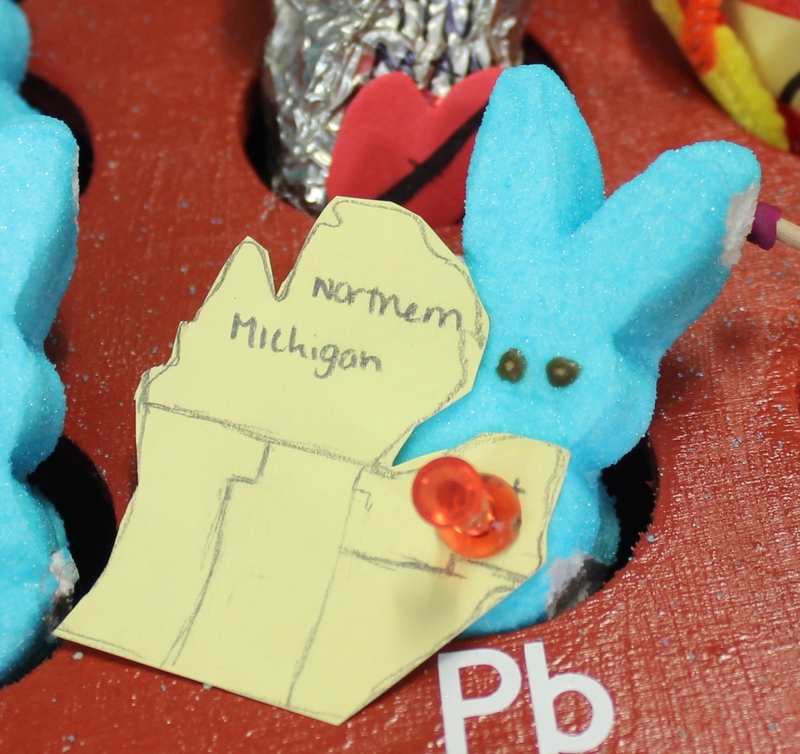 My Peep is a cut-out of Michigan, with a marker where Flint is located. 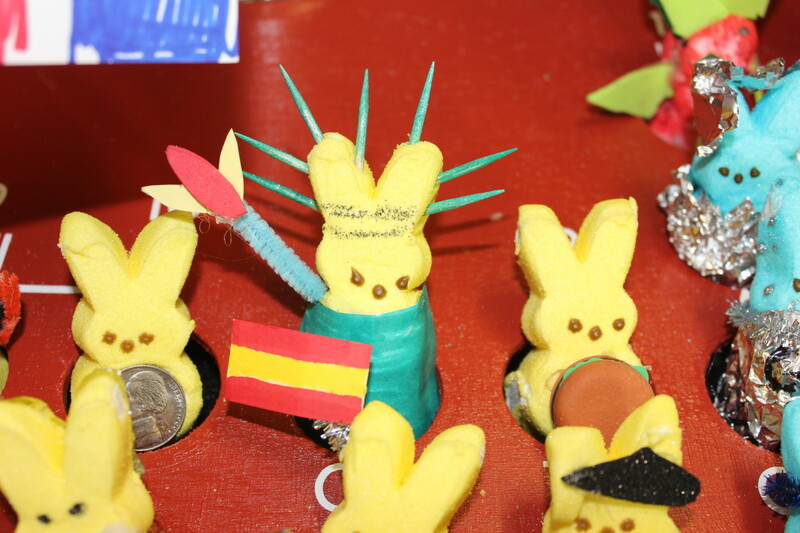 I chose to make my Peep the Statue of Liberty because the outside is entirely constructed out of copper metal. The reason why the Statue of Liberty is now a greenish-blue color and not the typical orange shiny copper color is because over time, copper patinas as it chemically combines with other elements. I used a chocolate bar with the words “radium infused” on it as a nod to Radium’s history as an additive in food and home products. I decorated my Peep with a pencil because pencils contain graphite which is a form of carbon. 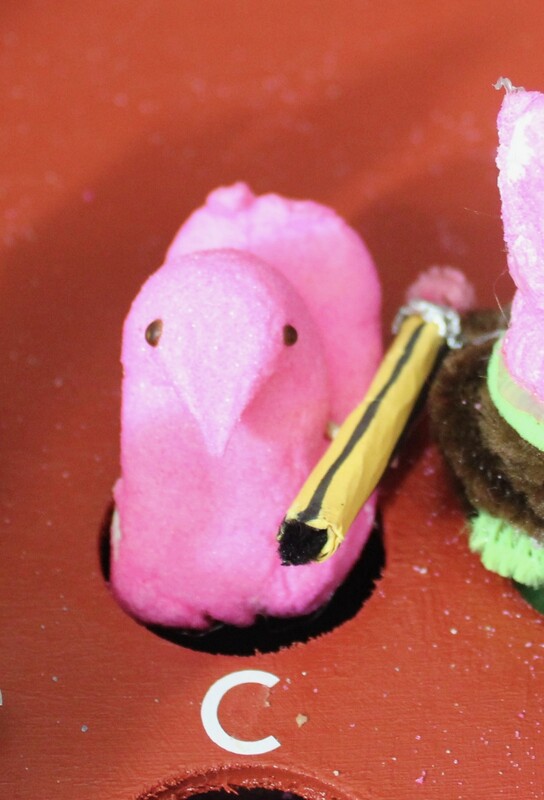 Most people think that a pencil contains lead but this Peep will address their misconception. Every time I think of tin, I think of the Tin Man from The Wizard of Oz. 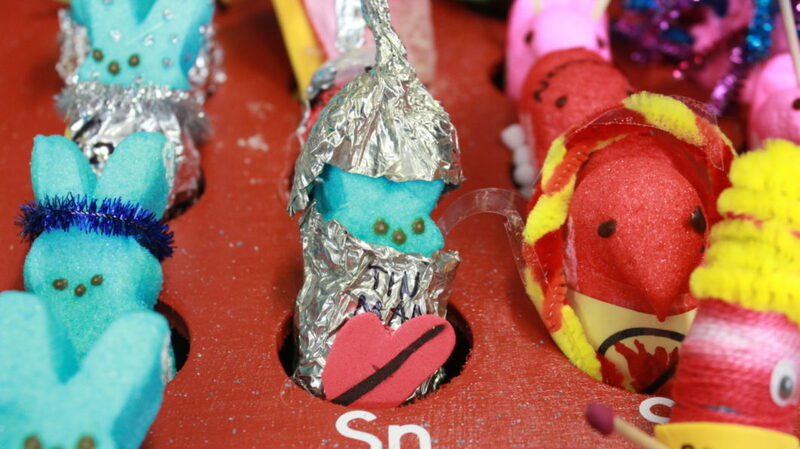 My chemistry teacher gave me real tin foil and allowed me to shape a suit for my Peep. 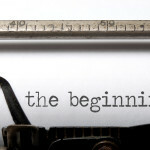 Of course, it lacks a heart and is searching for one. Pingback: The Open Notebook – Peep Ye, Peep Ye! Announcing the Winners of the World’s Finest Science-Themed Peeps Diorama Contest!